View screen shots for tournament setup, registered participants, brackets, match times and final results. The R2sports league application has the same features as the tournament software. 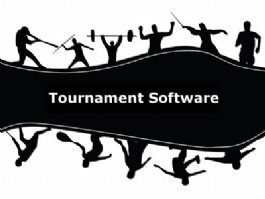 The R2sports software tournament application and league manager tool are online web applications that are easy to use. Save hours of time creating draws and setting game times. No need to download and install anything on your computer. Use the software on any pc or smart phone with internet access. Multiple directors can be logged in at the same time. Players and fans can enter and get all of the tourney info from one website. The printable bracket page allows the director to print multiple tourney brackets at the same time with selectable options to choose from. The left side of the page lists all the printable brackets in the event, they can be reordered by clicking the sort order link by name, by division type, and by number of division participants. For each division, the division name is listed along with the bracket format, and the number of competitors in the division. After highlighting a division by clicking on it, click the >> or All >> buttons to move to the middle printable bracket listings. Unselect brackets to print by Moving them all back to the left side by clicking the All << button. On the right side of the printable bracket options page, there are print options to change how the draw looks when it is printed. Single elimination brackets can be printed in presentation mode with the option to show the participants profile picture next to their name. The director can also force the printable bracket to only show rounds deeper into the division after early rounds have been played. For example, if 32 players start in an elimination draw, after the first 2 rounds are over, reprint the draw and force it to start with the quarter finals. For brackets with more than 33 or more players, when printed without resizing, they print on more than one sheet of 8 1/2 X 11 piece of paper. When changing to legal paper or printing on larger paper at a print shop, select the option to fit to 1 page, which will stop it from putting in a page break. For round robin and pool play divisions, there is an option to change the layout. One option allows the director to print round robin tournament brackets listing the games grouped by round. This option is most commonly used for tournaments. The other choice it to print a round robin schedule which lists all the matches by participant. This option is used more for leagues and seasons. After printable bracket selections are made, click the print selected brackets button for them to appear on the screen and print. It is important to do a print preview before printing. Set all margins to 0.25 and clear out all headers and footers. Also adjust landscape or portrait settings when desired. Portrait usually works best for draw sizes of 16 and higher, while smaller draws print better in landscape. Scale the brackets by change the percentage to make the bracket fill the entire page. For best results when rescaling brackets, select printable brackets that are around the same size, and rescale other sized brackets separately. If there is a pdf writer installed on the director�s computer, draws can be printed to pdf. Doing a google search for free pdf writers should help if there is nothing already installed. When printing professional looking brackets at a printing shop, print to pdf and email or take the files on a flash drive. Tourney logos or tournament sponsors can be printed on the brackets. Make sure to check the print background images choice in the browser�s print options or they won�t show up. Add logos through the tournament template setup.